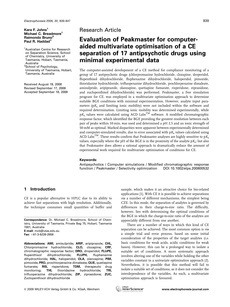 The computer-assisted development of a CE method for compliance monitoring of a group of 17 antipsychotic drugs (chlorpromazine hydrochloride, clozapine, droperidol, flupenthixol dihydrochloride, fluphenazine dihydrochloride, haloperidol, pimozide, thioridazine hydrochloride, trifluoperazine dihydrochloride, prochlorperazine dimaleate, amisulpride, aripiprazole, olanzapine, quetiapine fumarate, risperidone, ziprasidone, and zuclopenthixol dihydrochloride) was performed. Peakmaster, a free simulation program for CE, was employed in a multivariate optimisation approach to determine suitable BGE conditions with minimal experimentation. However, analyte input parameters (pKa and limiting ionic mobility) were not included within the software and required determination. Limiting ionic mobility was determined experimentally, while pKa values were calculated using ACD LabsTM software. A modified chromatographic response factor, which identified the BGE providing the greatest resolution between each pair of peaks within 10 min, was used and determined a pH 2.5 and an ionic strength of 50 mM as optimal. Marked disparities were apparent between experimentally determined and computer-simulated results, due to error associated with pKa values calculated using ACD LabsTM. These results confirm that Peakmaster analyses are highly sensitive to pKa values, especially where the pH of the BGE is in the proximity of the analyte pKa; but also that Peakmaster does allows a rational approach to dramatically reduce the amount of experimental work required for multivariate optimisation of conditions for CE.